After a while, one gets in a rut with certain things.. My hair is one of them right now. I felt I needed something to remove the buildup from using way to many hair products: if I blow dry it or leave it curly – I use about 3-4 products each time. Now, my natural hair is actually curly. It can look like Shakira or like Slash depending on its mood 😎so I reached out to the gals at @innersenseorganicbeauty for some help. 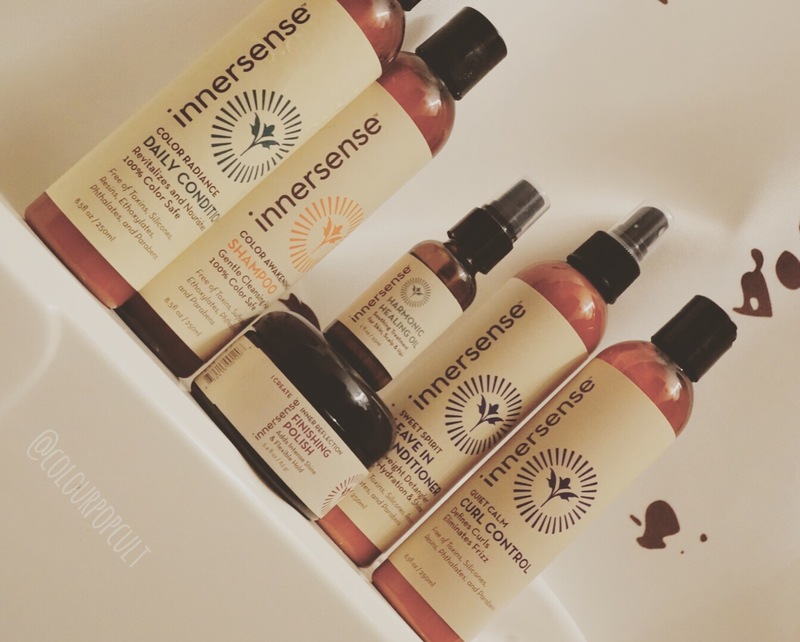 They recommended the IMMERSE hair ceremony to repair moisture and warned me to use very little amounts, as their products are very concentrated. Their stuff is 100% organic and free of toxins or animal byproducts, I was sold on the information on their site on which ingredients found in cosmetics are bad and why which I almost never pay attention to usually, but turned out an interesting read. The first time I didn’t listen and used a bunch of shampoo and of every one of the other products making my hair actually greasy (thinking more is more! Like the other products! I mean hello I have a lot of hair right?!). The second time I followed instructions and used very little of it, I let the shampoo wash away the sebum and other buildup and the conditioner soften it back to normalcy. This time I blowed my hair straight and my surprise when my hair felt lighter, it had volume and even as they warned me it would feel dry because of the removal of buildup, I recognized my hair’s original pre-coloring shine and couldn’t believe this was only one wash. I noticed my hair stayed cleaner and smelling great longer; I’m busy! Washing my hair or taking a long shower is a luxury now, so I appreciated it the fact that the buildup of products was gone and not absorbing lingering smells… Next wash I left it curly, I wanted to try the Curl Control lotion, and mixed with the leave in conditioner, it moisturized my locks and actually made me fall in love w my curls again. I remembered that curly hair, before LA LOOKS from the 90’s, I actually enjoyed dry soft touch me curly hair, what happened!?! She came back. The hubs now wants curly haired me more often, wink😜. Anyway! I’ve been on this for over a month, I’m def getting them again. I haven’t tried the oil on the scalp – only the ends but the polish is a MUST for short hair (cough cough a certain hubs pitches in…) and for the ends after I blow dry it straight… I can’t recommend this enough if your hair has buildup and overall feels weighted and limp..